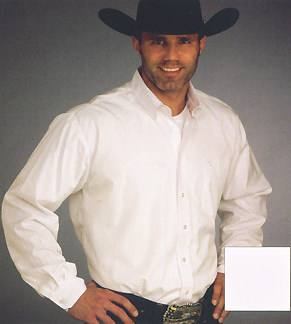 A Western Shirt is not just a Western Shirt. Cinch has a reputation for a rather dressy looking casual shirt. Each season brings a color theme in the men's Western shirt line. Often, we sell out of these before the season is starting good. 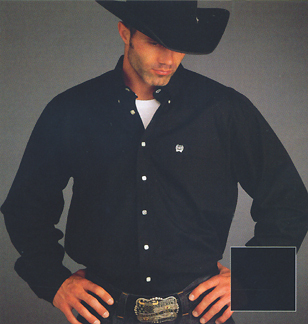 Cinch Brand Western Shirts offer a generous fit all over. If you prefer a loose fit, get your normal size. If you want a tailored fit, you might go down one size. Cinch shirts are sized XS to XXL, to fit the teens, pre teens, and grand Daddies among us! Worn by many top champion professional riders in rodeo, western pleasure, and they are worn everyday, for all aspects of their lives; not just to win extra prize money. You've seen the National Advertisements, Now it's time to try these for yourself - Take Charge! 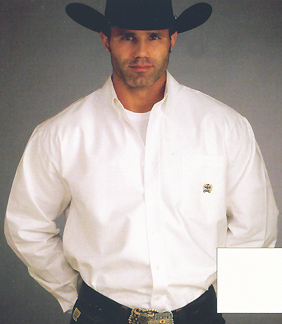 Cinch Shirt Replenishment Program - These are the basic Western Shirts in 100% cotton, Pinpoint & Oxford cottons. Almost always readily available for you. Always comfortable. Always stylish! Cinch Black Pinpoint Oxford A fine thread for a "slick", fast look. This is a material that can look dressy when you need to, and also take the dirt and sweat of your arena. 100% Cotton Pinpoint Oxford Cloth. Reinforced Neck is Taped for better wear. Classic Cinch Cut Body Style & Fit. This is a fuller cut in back & shoulders, a little longer than normal in sleeve, for easy reach, longer in the tail. Cinch White Pinpoint Oxford A fine thread for a "slick", fast look. This is a material that can look dressy when you need to, and also take the dirt and sweat of your arena. Cinch White Oxford Shirt A thicker thread for a little more textured appeal. This is a material that can let you appear above the norm, feel better than normal, and make that show ring impression in the arena, the bar, the office, or... It also takes the dirt and sweat of your arena without falling apart easily. 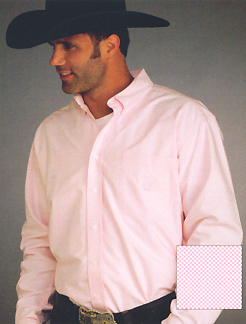 Cinch Pink Oxford Shirt A thicker thread for a little more textured appeal. This is a material that can let you appear above the norm, feel better than normal, and make that show ring impression in the arena, the bar, the office, or... It also takes the dirt and sweat of your arena without falling apart easily. Cotton shirts are worn for comfort. Cotton is a natural fiber that is woven into threads that allow your body to breathe. And if the weather gets smoldering hot, your body sweat will wet cotton, and the rapid evaporation factors will have a cooling effect on you. This is why your granddad would wear long sleeve cotton shirts in the heat of summer, staying rather cooler than you, in your short sleeve T Shirt. Cotton washes easily and can become better with age. Starch applied as you iron, will give a protective coating against stains. In fact, I find that dust and slight dirt will easily wipe away, allowing cotton shirts to look fresh, for more of your work day. This is important as I work on dark felt hats, leather, and often get "stuff" on my clothes. I can feed up in the morning and wipe off the dust & hay, without having to change clothes to get on to the store. I like to turn my shirts and jeans inside out as I wash, to keep the machines agitators from beating up my clothing. Inside out, the dirt is being taken out the same way it got into the clothes. I like a good spray starch as I ready to steam iron. This makes the wrinkles just fall right out, and reduces my time by at least 1/2. Although Cinch uses the best snaps & buttons, the heat & chemicals of dry cleaning process can take a toll on your fasteners if your cleaner does not become careful with your stuff. I'm a do-it-my-selfer. So, I like to put on some good music, maybe use a little essence of lavender, get lost in my thoughts, and iron at the same time. Doesn't seem like work this way!